With the first night of Hanukkah around the corner, many friends have asked me for ways to cook something different for their home celebrations of the Festival of Lights. I certainly think about that question myself, since I always want to help make sure that my sons appreciate their own Jewish heritage. 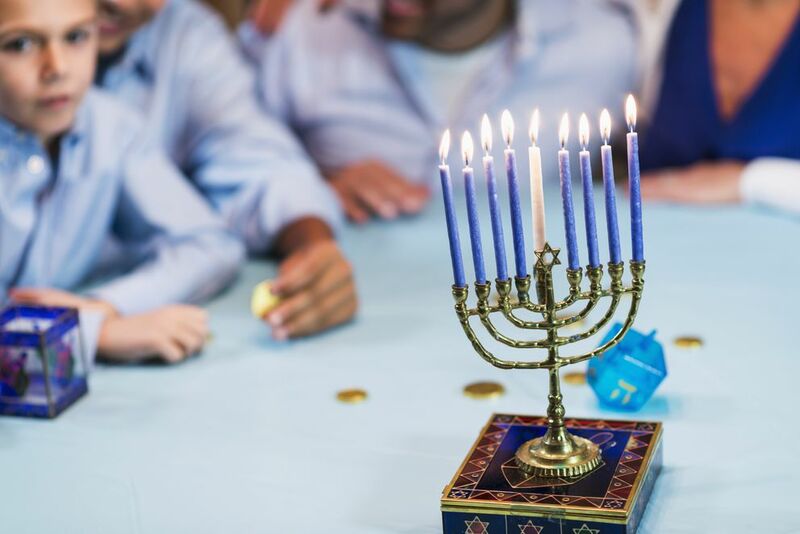 Cooking for Hanukkah typically involves foods cooked in oil, a symbolic commemoration of the one night's oil supply that miraculously burned for eight nights when freedom fighters recaptured the temple in Jerusalem back in the second century B.C. So, most holiday menus feature pan-fried or deep-fried potato pancakes (latkes). But many health-conscious people today try to avoid carbohydrate-laden potatoes, so I started thinking about a possible substitute. My surprising discovery was that you could make delicious latkes using shredded beets, which have only about half the net carbs (a figure that represents the total grams of carbohydrates minus the total grams of fiber) in potatoes. Yet fresh beets, shredded and combined with simple seasonings, eggs and some flour, cook to a pleasingly firm yet tender consistency similar to that of potatoes, with a wonderfully sweet flavor and brilliant ruby-red color (or bright yellow one, if you use golden beets) all their own. Some people may be resistant to beets, remembering flavorless canned ones from childhood. If that is the case for you, fresh beets will be a happy revelation. 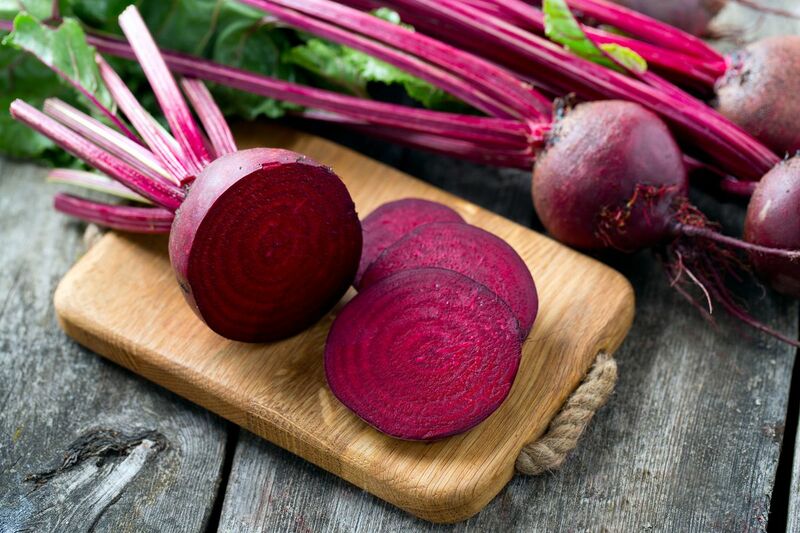 One other memory you may have of beets is true, however: Their red juices can stain your hands or clothing. I suggest working over your sink and wearing kitchen gloves and an apron during peeling and shredding. And be sure to carefully pat the shredded beets dry with paper towels, so the pancakes will cook up crispier and won't cause spattering in the thin layer of hot oil you use for cooking. At Hanukkah parties, potato pancakes are traditionally served with both applesauce and sour cream. With the flavor of my beet latkes in mind, I’d also like to share a homemade, honey-sweetened applesauce recipe that includes a pleasing note of spice from some whole yellow mustard seeds, which you can find in any well-stocked supermarket’s seasonings aisle. Simmered along with the apples, the little round seeds pop open pleasantly when you bite on them, adding a subtle touch of exciting flavor to the sauce. Serve the latkes and applesauce (and, yes, some sour cream, if you like) as a first course or the featured treat at your Hanukkah dinner. Or offer them anytime as a great side dish for meat or poultry dishes for the next several weeks of what I hope will be your very festive holiday season! About an hour before serving, start making the honey-mustard applesauce. Put the apples, apple juice, honey, sugar, lemon juice and zest, mustard seeds and salt in a large, heavy-bottomed saute pan. Bring to a low boil over medium heat, stirring occasionally, and then reduce the heat to low and continue cooking until the apples are soft enough to mash with the back of a fork, about 20 minutes. Transfer the mixture to a heatproof mixing bowl, remove the lemon zest, and use a potato masher to mash the apples to a coarse puree. Set aside. Start preparing the beet latkes about 30 minutes before serving. Put the shredded beets in a large mixing bowl. With several layers of paper towels, press down on them to absorb excess moisture, turning the beet shreds and using more towels as necessary to absorb as much moisture as possible. Add the eggs, flour, salt and pepper to the beets. Stir until thoroughly combined. Heat a large nonstick skillet over medium-high heat. Add just enough oil to coat the bottom. When the oil is hot enough to flow easily when the skillet is tilted, use a tablespoon to scoop up a heaping spoonful of the beet mixture and place it in the skillet, gently pressing down with the back of the spoon to flatten it. Fry until the latkes are golden-brown, about 3 minutes per side, turning them with a small scratchproof spatula. When the latkes are done, transfer them in a single layer to a baking sheet lined with paper towels. Repeat the process to cook the remaining mixture, adding more oil to the skillet as necessary. Serve the latkes as a side dish with main-course meat, poultry or seafood, or as an appetizer on their own, passing the applesauce alongside.